As adorable as they are delicious! Each Birthday Mini Sugar Cookies box is full of fresh-baked and hand-iced sugar cookies in a birthday theme. 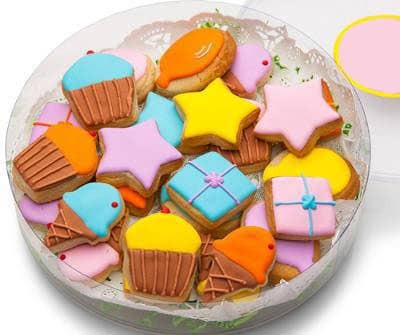 This lovely acetate container is filled with impossibly cute sugar shortbread cookies featuring assorted hand decorated birthday designs including Gifts, Cupcakes, Balloons, Ice Cream Cones and Stars. These cookies are a perfect way to send the sweetest greetings for a very Happy Birthday. Our Mini Cookie Acetates come in assorted styles for every Special Occasion. Acetate measures 6 7/8" Dia. x 1 1/2" H and is filled with coordinating krinkle shred. Cookies are presented on a fine lace doily.